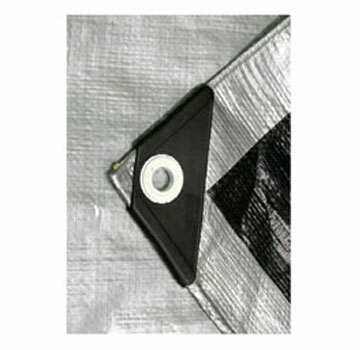 PRODUCT: 26' X 40' HEAVY DUTY, 14X14 WEAVE, UV-GRADE SILVER/BLACK TARPS. BULLDOG BRAND. (1). PRICE/TARP. APPLICATIONS: Designed for all types of high UV and long term sun exposure, rain protection or heavy duty areas including house tarp, boat tarp, truck tarp, hay tarp, field tarp, trailer tarp, storage cover, roof tarp, field cover, infield cover, infield tarp, field tarp, gym floor cover, camping tarp, boating tarp.